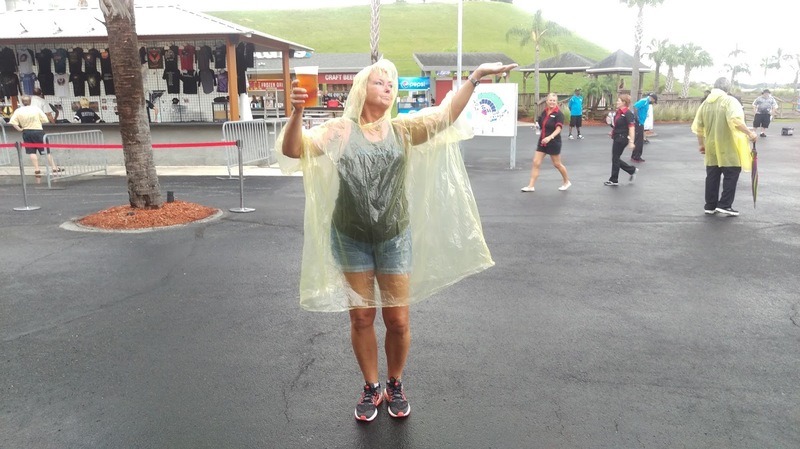 BrewNymph®: Back Again ... Another Weekend in Tampa for Concerts and Beer! Back Again ... Another Weekend in Tampa for Concerts and Beer! When you visit Tampa two weekends in a row, life can't be all that bad! 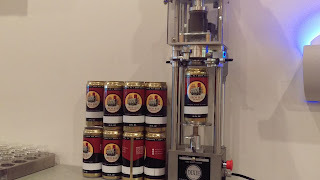 If you follow this blog, you know that I attended the opening fest of the six-city Beer Camp tour last week (check out the story on the home page). 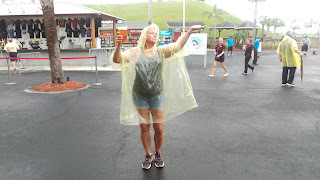 It just so happened that a while ago, the rock band Journey scheduled a concert in Tampa, along with The Doobie Bros and Dave Mason, for this past weekend at the Amphitheatre, and that meant back-to-back trips to the "city by the bay" on Florida's Gulf Coast. (Some of you might even get that reference to Journey's song Lights. And, yes, I know it was actually written about California). 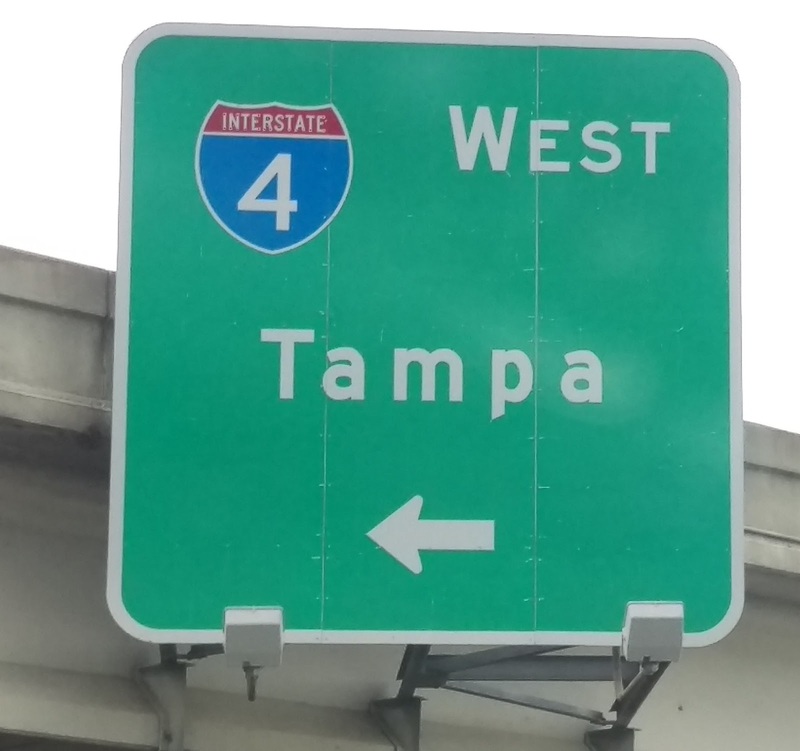 The drive to Tampa was somewhat chaotic this time around (preceded by lost emails, followed by the discovery enroute that this writer had no shoes in the car, with an ensuing stop at the outlet mall at Vineland, further followed by traffic and detours, and then rain...). But, there was nonetheless a timely arrival for the concert meet-n-greet at the Amphitheatre, after what seemed like a 5k from the car to the entry (but, I did manage to have a beer along the hike). I've attended concerts at the venue previously, so I'm no stranger to the parking lot there. All in all, a great night of music (8th row seats help). I didn't sit much, and I took some awesome concert photos! Because last weekend was an in-and-out trip, there was no doubt that this time around, there would be some beer exploration on Saturday! 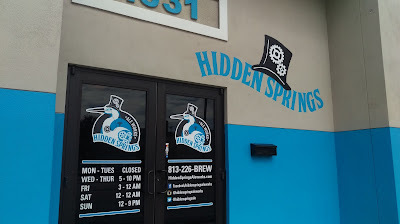 A couple of good beer friends from Tampa let me know that they were heading to Brew Bus Brewing and Hidden Springs Ale Works, so I decided to switch up some initial brewery visit plans and meet them there. Two new brewery visits for the list! 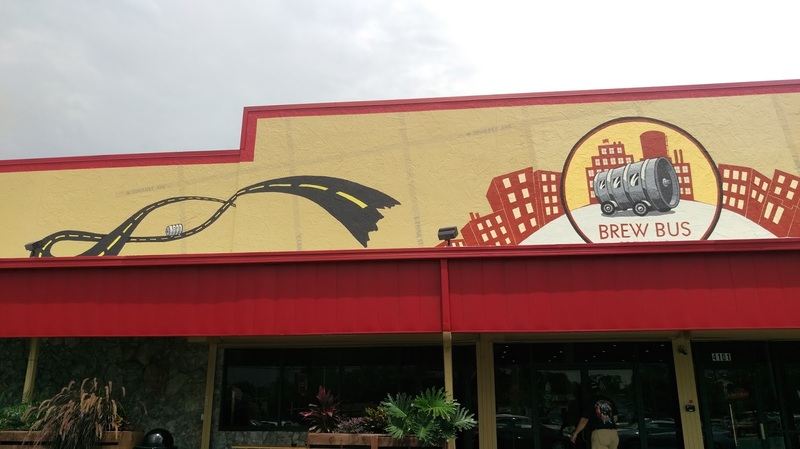 As you likely already know, Brew Bus Brewing acquired the Florida Avenue Ales facility on North Florida Avenue last year, remodeled it, and opened its new bus tour terminal and brewery in that location this past spring. 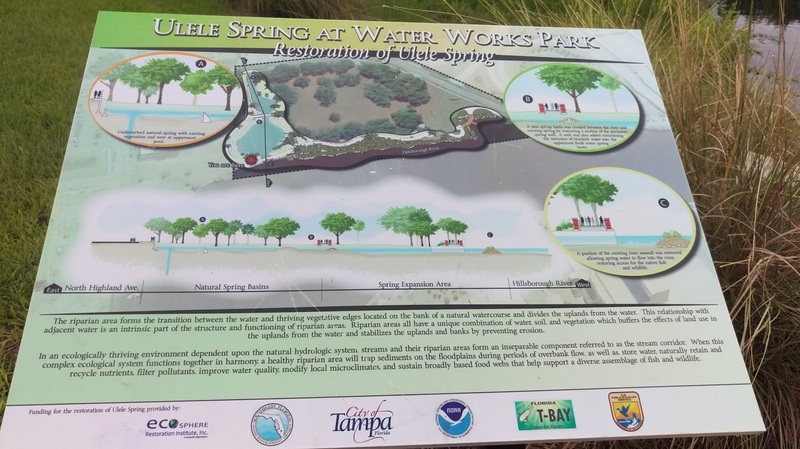 A Grand Opening took place in April. I had visited the former Florida Ave Ales a few years ago, so I was looking forward to seeing the changes. 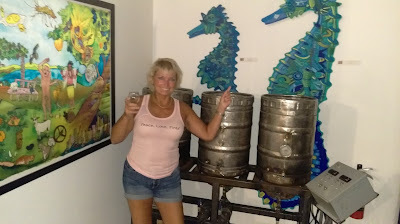 I was unable to locate my photos from that prior visit, but it reminded me of a casual garage turned into a beer cave, very laid-back. The former decor featured picnic tables, umbrellas with chairs, couches, and tropical art on the walls. 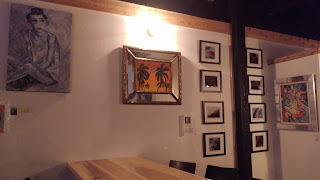 I even seem to recall remnants of a tiki bar and an old bike in the corner. The bar was small, situated along the back wall, and there was ample seating. 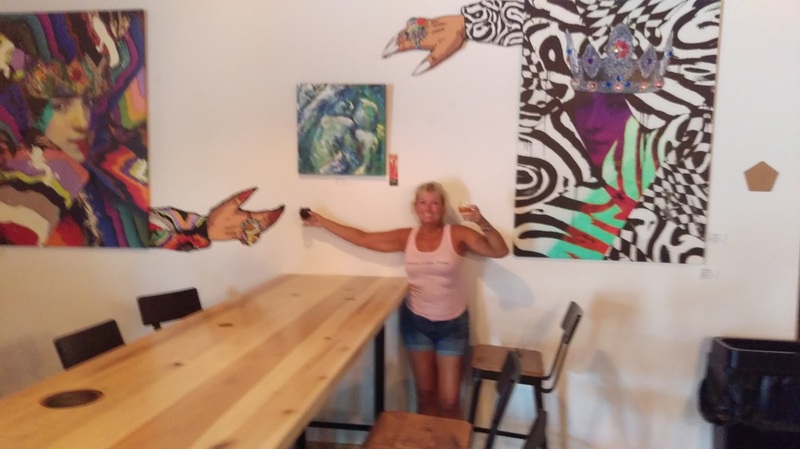 While Brew Bus may still be brewing a couple of the Florida Ave Ales, it did a complete remodel of the tap room, and transformed it into an eclectic, modern bar with a high ceiling, color blocks and clean, crisp lines. 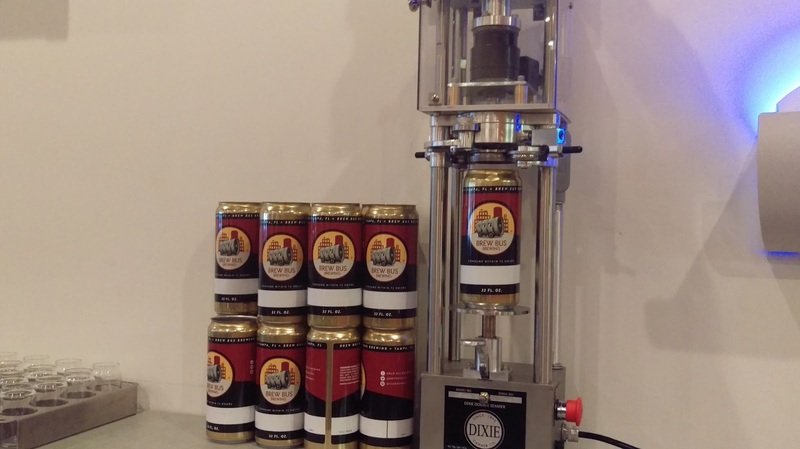 The bar, moved to the left wall, now features 20 taps and a Crowler canning machine. It's a large, open space with wooden tables and barstools. 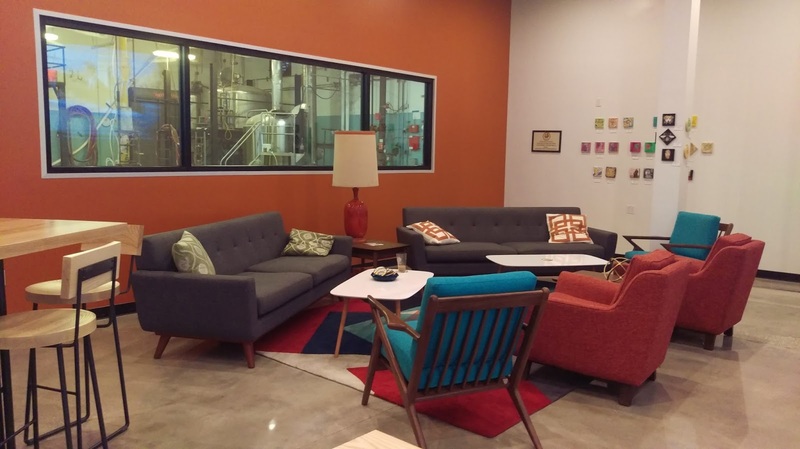 The back of the tap room offers a few colorful, cozy sofas and plush chairs. 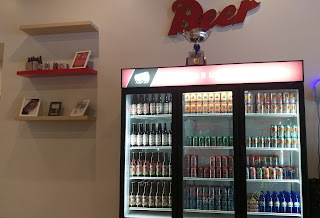 There's also a cooler stocked with cold Brew Bus beer to-go. 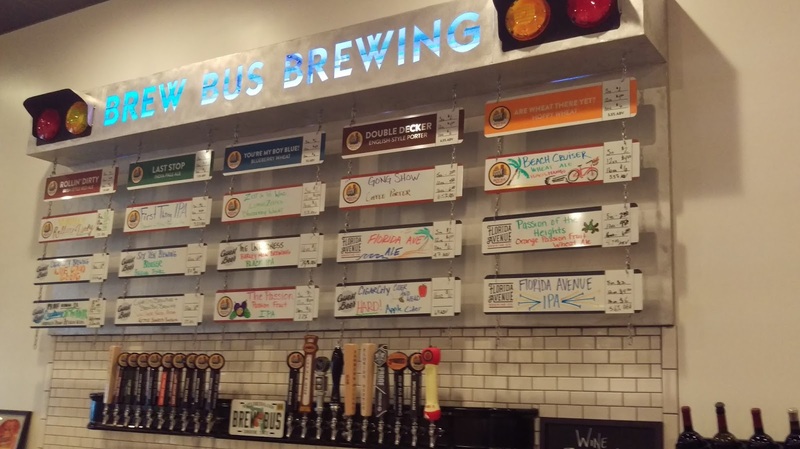 The tap list includes the five Brew Bus core beers (Are Wheat There Yet Hoppy Wheat, Rolling Dirty Irish Red, Last Stop IPA, You're My Boy Blue Blueberry Wheat (GABF 2015 Silver Medal Winner, by the way), and Double Decker Porter. 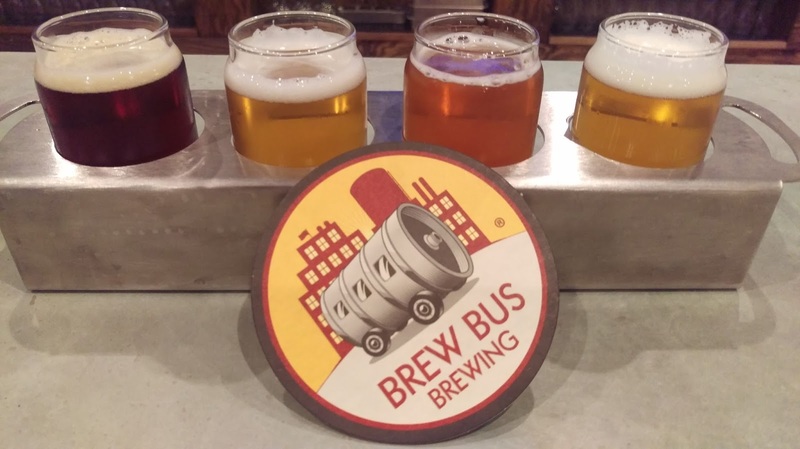 Brew Bus Brewing has also earned various medals from the Best Florida Beer Championships, World Beer Cup, and US Open Beer Championship. In addition to the core beers, the bar features around five Brew Bus seasonals, a couple of Florida Ave Ale beers, and guest taps from other breweries in Florida. Brew Bus continues to contract brew at Brew Hub in Lakeland, Fla. (yeah, that's another blog post), while brewing beer at the new flagship facility. Currently, most of the Florida Ave Ales brewing equipment is in storage and will be moved back into the terminal brewery. I'm already familiar with the core Brew Bus beers, so I was looking forward to trying some new ones. There was a good selection on the tap list, including some creative types. And, if you don't want a full pint, go with a flight, or the optional 5-oz or 12-oz pours, which are pretty nice, especially if you want to try a variety. Heavy lifting. Or, photo op. Hey, I liked the visit to Brew Bus Brewing, and the beers are solid. 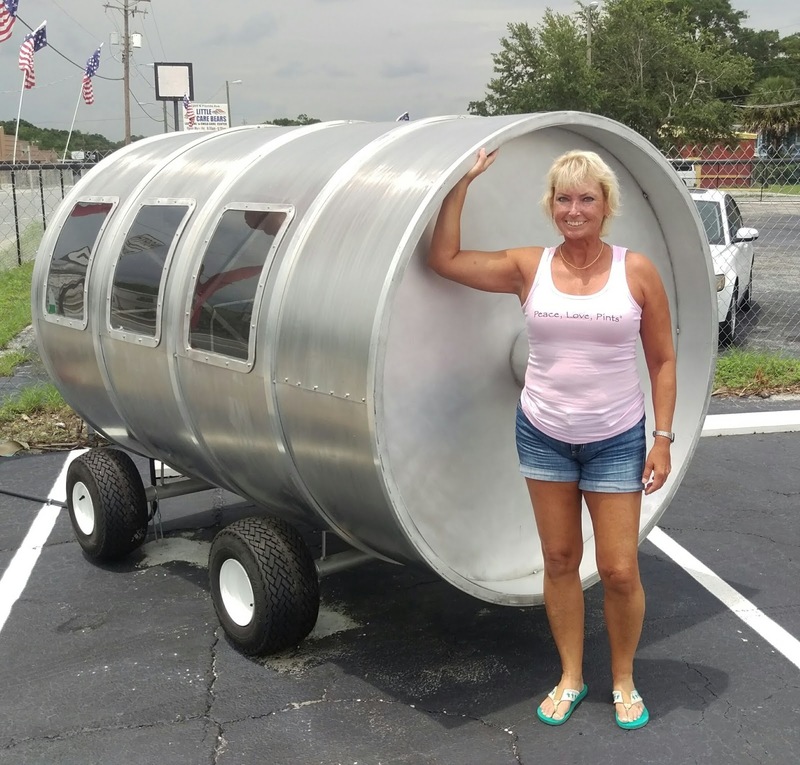 Of course, you can also schedule one of the local brewery bus tours which visit breweries in and around the Tampa area. The tours now run from the new terminal/brewery. 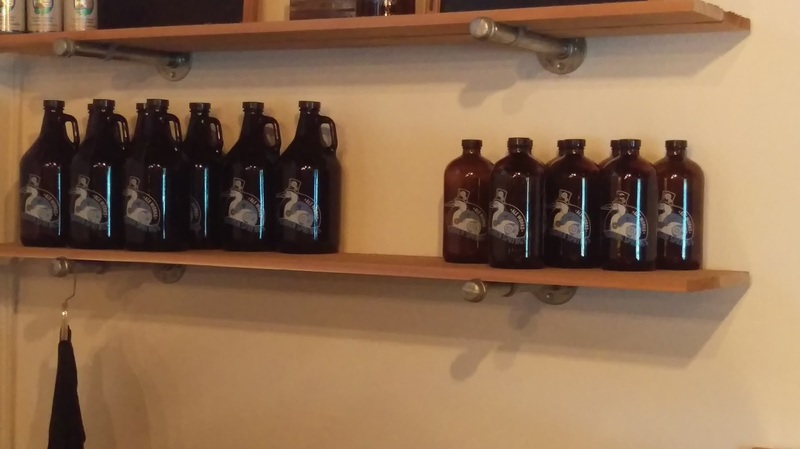 I don't think you'll have too much trouble finding a beer that you like in the tap room, either. 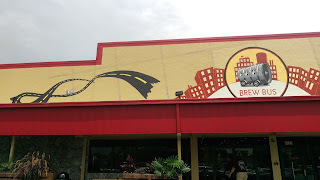 Brew Bus Brewing is located at 4101 N. Florida Ave. in the Seminole Heights area of Tampa. Check the website for scheduled brewery tours. The tap room is open daily. 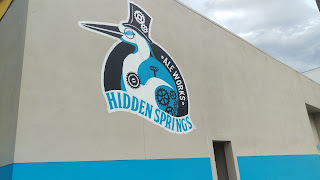 Of course, I had heard and read about Hidden Springs Ale Works, which opened last September in the Tampa Heights area, but I didn't know exactly where it was. Turns out it was only a few blocks away from the previous stop, so a couple of turns later, park the car again! The brewery and tap room are housed in a warehouse-type building, which apparently stood vacant for decades. The name refers to local springs in the area, but which aren't really detectable. 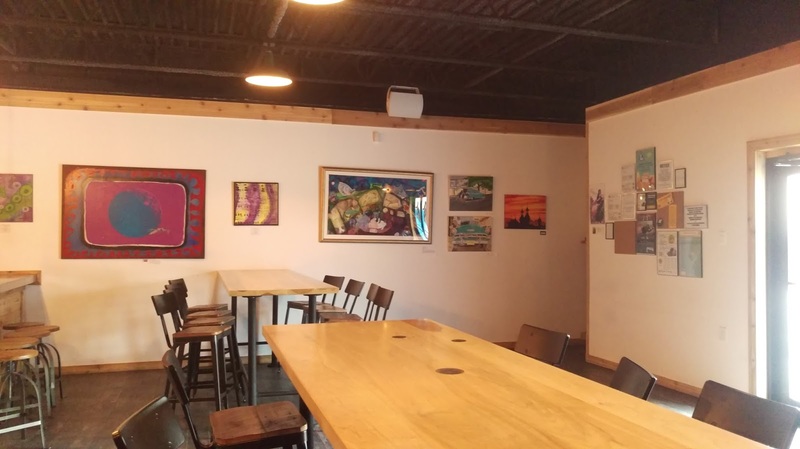 Walk in the door, and the first thing you might think is that this is a really cool little tap room. 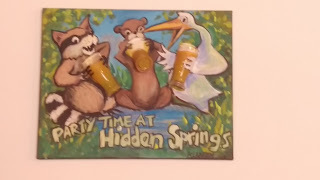 Aside from the whimsical and fun logo (I love birds, so I was drawn to this one), you'll also notice the abundance of artwork that grace the walls. 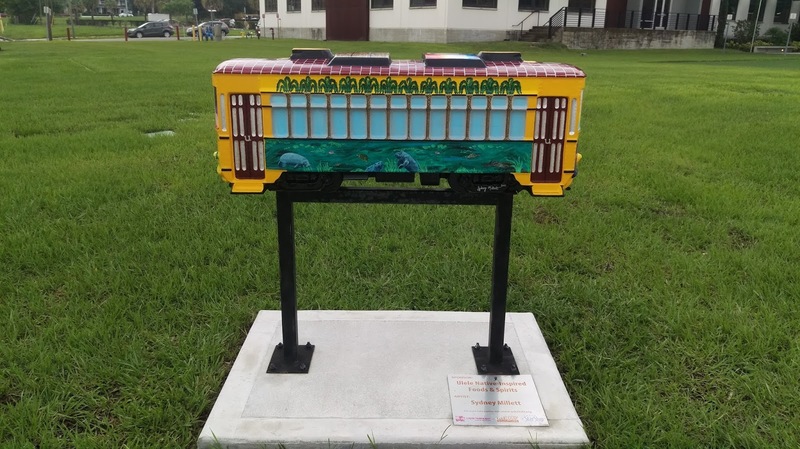 The art pieces were done by local artists, and each includes a short description of the work and the artist -- and, yeah, they're for sale. The artwork ranges from still life to abstract. 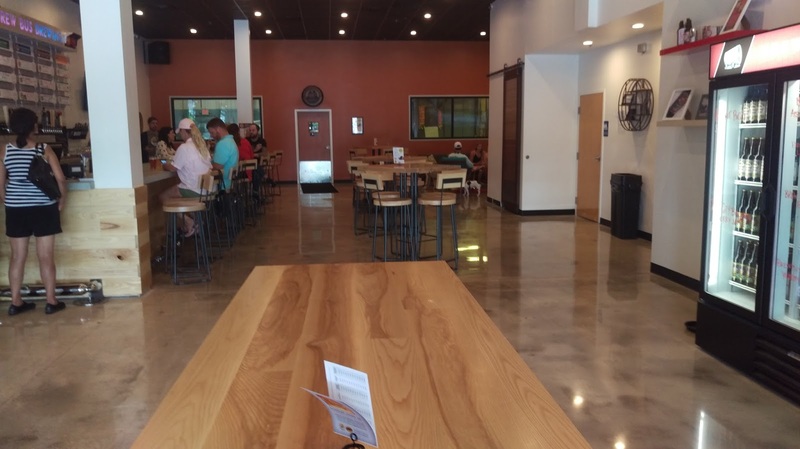 The overall tap room ambience is industrial-meets-art, with designs of gears in the logo, which complement the iron-themed light bulbs over the bar and the wood and metal chairs. 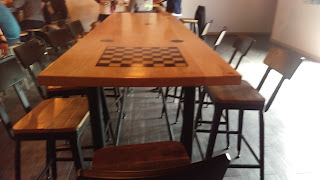 It's a dimly-lit and comfortably chill place, with high top tables and chairs. 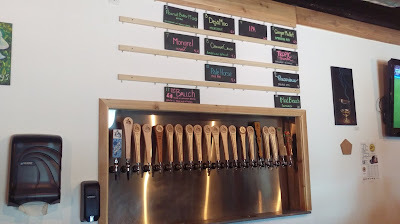 Even the tap handles are wood, in line with the theme. The Mongrel Pilsner (5.7 ABV) is pretty much what you'd expect from a pilsner: light and easy drinking, except that it didn't have a hoppy bitterness. A very pleasant, cracker-like beer that is easily repeatable. The American IPA (6.8 ABV) is a citrus-based hoppy ale, in which I also noted pine and herbal notes, which made for a more blended flavor profile, which I really enjoyed. 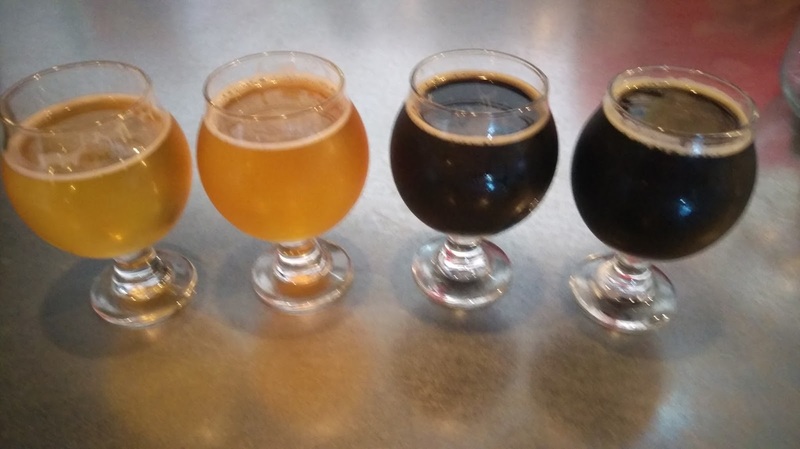 A milk stout, the Deja Moo (6.1 ABV) had a surprising smokiness in both the aroma and flavor, along with a strong chocolate presence. Overall, it's a pretty good beer from a unique combination. And, if you're into the peanut butter taste, take hold of the Peanut Butter Moo (this on nitro, 6.1 ABV), a milk stout with peanut butter. There's a definite peanut aroma, that goes along with peanut flavor, apparent chocolate, and a hint of smoke. I'd say that was a good sampling of some different styles! Hidden Springs Ale Works is currently brewing from a five-barrel system, although it already has a 15-bbl system onsite, which it hopes to put into operation within the next month or so, which will allow for further distribution in the local area. I think they're off to a good start. 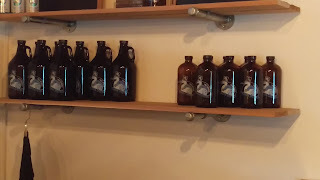 Growlers are available, too. The tap room is open 5 days a week, closed on Monday and Tuesday. Hidden Springs Ale Works is located at 1631 N. Franklin St., in Tampa Heights, between Seminole Heights and Water Works Park, which borders the Hillsborough River. It's also a relatively short drive from Ybor City and Downtown. If you're in the area, check it out, I think you'll be glad you did. It's a beautiful place. 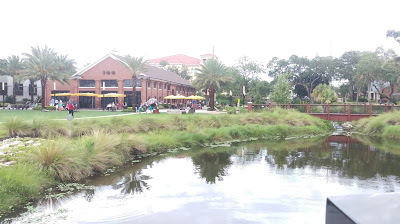 The restaurant sits in a large, spacious building adjacent to Water Works Park and along the Hillsborough River. 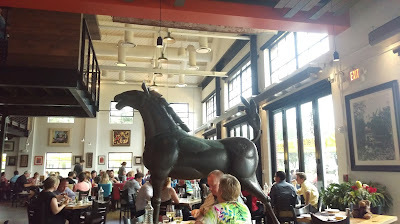 When we arrived, sometime around 6:30pm, there was already a steady crowd, with an approximate 45-minute dinner wait. 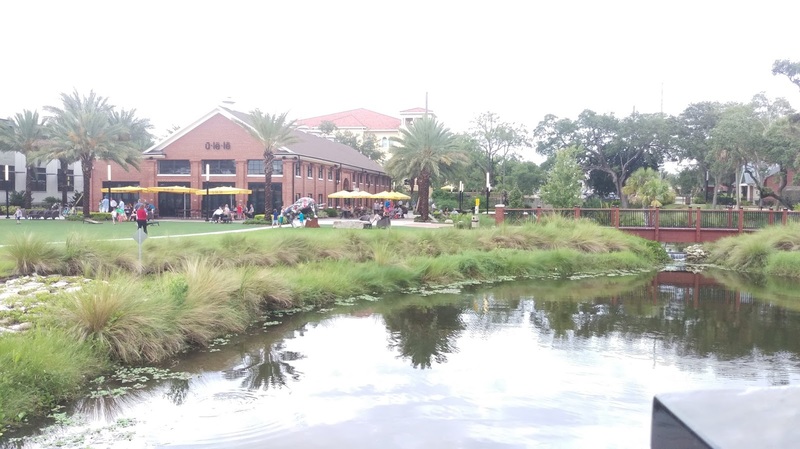 No problem -- that meant time to explore the Riverwalk and take in the picturesque setting. 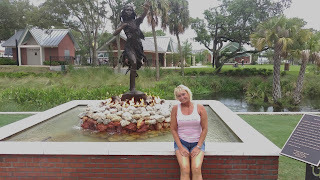 Statue of Ulele and a ring of fire. After that, it was time for a beer! The bar is situated inside just to the right of the entry. Of course, it's a full liquor bar, which features the Ulele house beers, comprised of five cores and several seasonals. 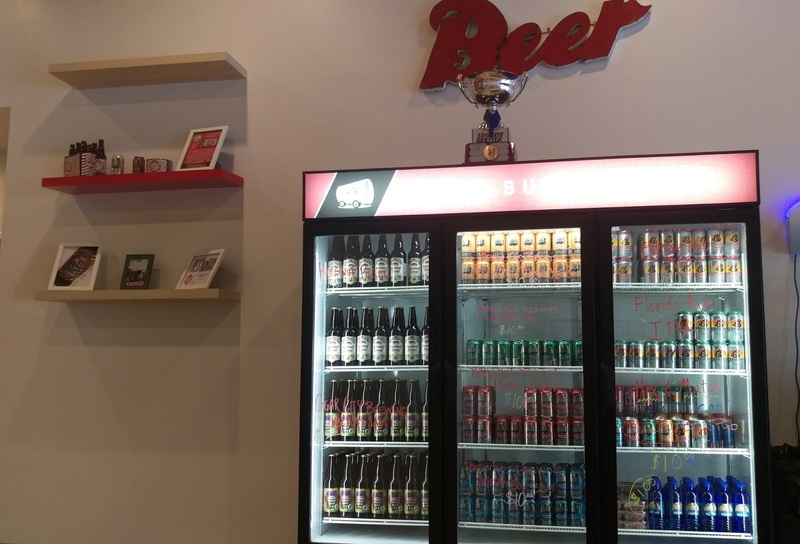 The main beers are: Rusty's Red amber lager, Water Works pale ale, Ulele light lager, Magbee's Honey Lager made with local honey, and Wedding Beer lager with berries. Ulele's light lager earned silver and bronze medals at Best Florida Beer Championships in 2015 and 2016, respectively; and the amber lager earned a bronze last year. 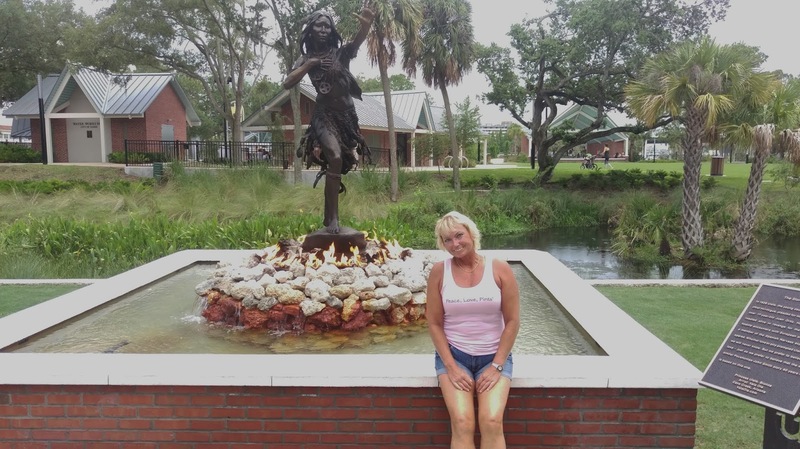 I ordered the honey lager and headed back outside to read about the legend of Native American Princess Ulele while dodging a few raindrops. The honey lager poured a dark gold/amber color (darker than I expected) and is a sweet and bready lager, with a toffee-like character. 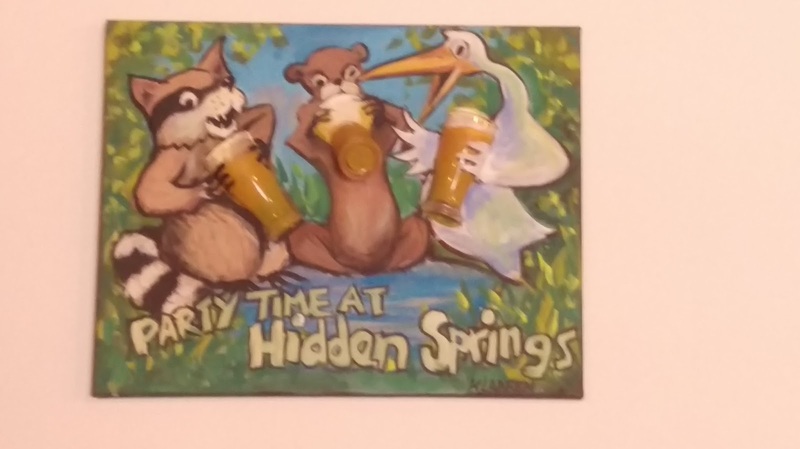 It's a relaxing beer, perfect for sipping while enjoying the surroundings. 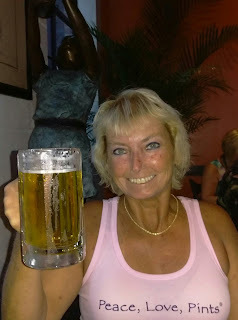 Following that, during dinner, I opted for the pale ale, a crisp, lighter rendition of a pale ale, with a bit of a bite on the back and notes of citrus; a good dinner beer, and in fact it paired well with my seafood choice. was a popular spot for photos all evening. 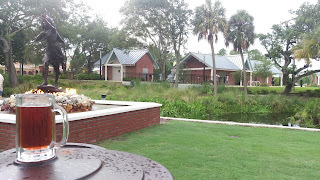 The restaurant offers lunch and dinner menus of "native-inspired" foods from Florida prepared on a 10' barbacoa grill. The appetizers and dinners are culinary creations and include salads, seafood, steaks, pork and poultry. 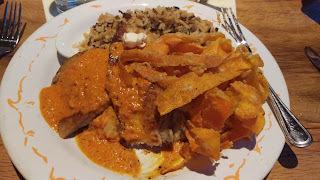 I opted for the Florida Pompano, smothered in a sun-dried tomato shallot cream sauce, served with lightly fried carrot ribbons and a side of white cheddar garlic mashed potatoes, topped with popcorn (yes, popcorn). The bone-in ribeye was also one of the best steaks I've ever tasted, charred on the outside, yet tender on the inside, full of flavor. Keep in mind I'm from the Chicago area, which may be known for its steaks just as much as its pizza, so I can be a tough sell sometimes. flavorful and complemented the fish without taking it over. The most creative and tasty use of carrots that I've ever seen. The restaurant has outdoor patio seating under umbrellas, and inside dining on the main floor and upstairs on a suspended second floor. The floor-to ceiling windows provide a dramatic overlook to the serene outside setting. 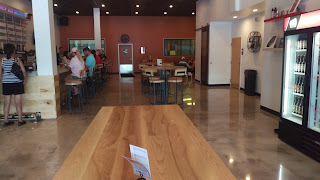 The open kitchen is located adjacent to the bar. The service was outstanding, and we were not rushed. If you're looking for a dinner "experience," consider visiting here. Large, open main floor dining area, with high ceilings. 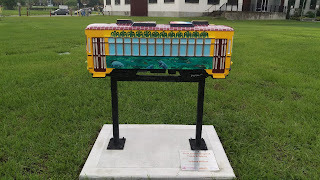 Unique sculptures throughout the area. 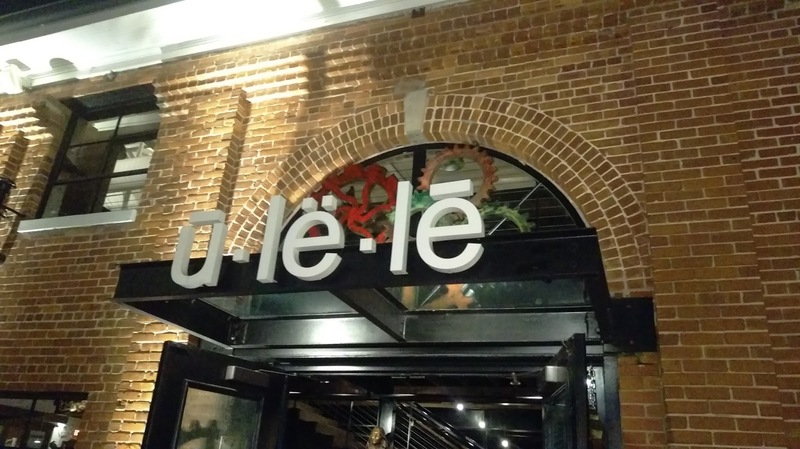 Ulele is located at 1810 N. Highland Ave. in Tampa Heights, just north of downtown. It's open 7 days a week, at 11am, and reservations are accepted. And, THAT was another weekend in Tampa! 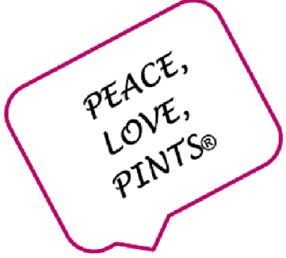 Needless to say, there are many more breweries I've yet to visit there, so I think there just might be a return trip or two. I might even remember my shoes next time, but I don't think I'll have too much of a problem finding another Florida brewery ... actually, I have a couple more at the top of that daunting "list" already. Til next time, Thanks for reading, and see you out and about around Florida somewhere ... Cheers!